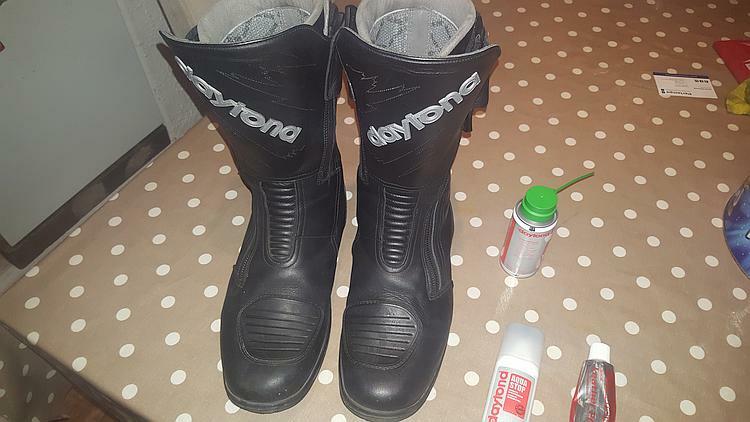 After the purchase of my Daytona boots I had cleaned them a couple of times with a damp cloth and a bit of boot polish. 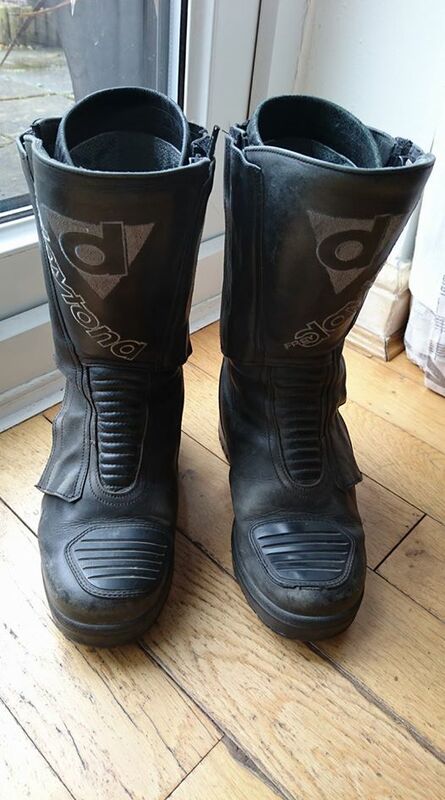 But following a bit of investigation on the Daytona boot forum (yes their is one lol) I was told off for not taking the appropriate care of my boots. Anyone would think I had committed a mortal sin, cruelty to animals or other similar antisocial offence. 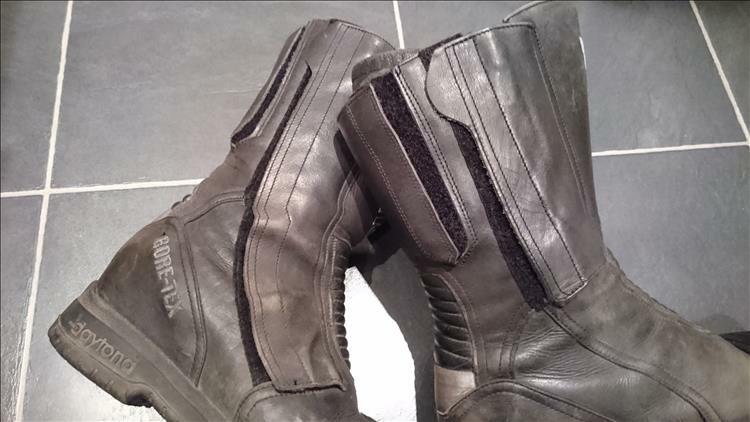 So following advice branded onto my forehead by several forum members I decided that in order to extend the life of my boots by a least a year according to 'DAVEDEAN6' from New York I should purchase a cleaning kit and not abuse my boots any longer.. The general advice was don't bother with the black polish, that's just a filler if you scratch them. But stick to the 3 main items - the neutral polish, the waterproofer and the zip polish/lubricant (yes that's right zip lube). A quick google search reveals the kit available on Amazon for the princely sum of £27.34 for the three. A quick dab of the credit card and 4 days later the stuff arrives. The bottles are much smaller than they appear on the screen. Also included is a full instruction pdf. The turbo zip grease simply sprays on the zip like WD40 or chain lube. It contains Teflon particles suspended in a sticky grease. It is totally clear once sprayed and really does make the a zip move very smoothly. It's pretty impressive stuff. Then the aqua stop is applied which is a waterproofing agent. Once applied with the built in sponge it dries clear and if you dribble water on the leather the water beads across the surface and runs off so it does appear to do its job. Now the question is whether the kit is worth £27? Well I'm not really sure, it seems a lot of money even to me but the boots were an expensive item so maybe expensive polish is the way forward. I can only report back at some point in the future if they leak or get damaged. The polish stinks - I mean anything that smells that bad must be good for my boots. Strangely I have lavished more care on cleaning my boots than cleaning my bike. I felt quite ashamed when parking my bike next to Sharon's spotless gleaming bike on Sunday. However in my defence I would like to say my boots were much cleaner than Sharon's even if my bike was disgraceful. The polish does seem to work well and the boots shine up nicely so I will report back in 30k miles or so. Have you experience of a similar product? Do you have an amazing tip to keep your boots waterproof/clean/cared for? Which boots would you recommend? We'd love to share your insights here on the website. Click Here. Oh Pocketpete you've done it now. Sharon will be polishing her boots to a military shine now you said here boots were dirty. Haa I am past caring. My boots were second hand when I bought them and I have added 3 years and 27,000 miles of harsh British weather on top. I did actually give them a clean I will have you know Pocketpete before our ride. :-). Sadly these boots no longer have any shine left in them. They go camping with me and I crawl around in them when camping and also when fixing the bikes so they are very scuffed. 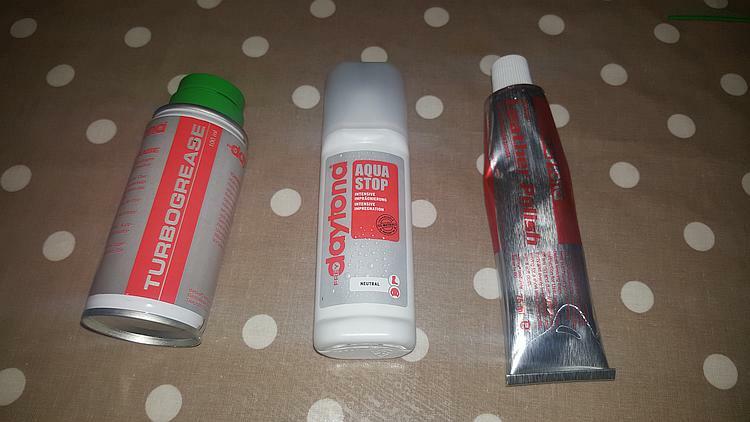 I have the Daytona aqua stop which I do apply occasionally. I have not however bought into the other products. I never have had a problem with the zips so far. As for the polish..well you seen my boots a clear polish would do nothing for my boots, the only thing that may bring them some form of respectability would be a good coating with black polish. But I am wary in case the polish somehow interferes in the breathability of the Gore Tex and thus render my wonderful waterproof boots non waterproof. I have used black polish on my boots very sparingly on occasion in the past but the possibility of it causing my boots to leak made me give up using it. So I choose the scuffed look over a possible soppy wet feet look. If there is anything in your errr wonderful forum that says I can use black polish Pocketpete without it causing my sensitive boots to implode then please let me know and I will give them a bloody good coating in it. Maybe however you can ask them this before you are banned from it by admitting you actually ride with someone who takes little care of her precious boots, abuses them terribly and still reaps the benefits!! I used to use stuff called aquabloc (I still have a bit left in the tube) which did very much what you say and was nowhere near £27. A quick seach seems to tell me that it no longer exists (or I have the name wrong). Deep down I sense some hidden shame and worry that the boots are letting the side down. On the forum the black leather restorer polish is the thing to sort out the marks scuffs and restore the lovely black shine. The reason I didnt get any was my boots were new with no real scuffs or marks. I'm sure a tube of that followed by the warterproofer will be just to the thing to put a smile back on your boots waterproof face. Its not cheap. £ 10.99 or so. I am told that Black boot polish interferes with the goretex layer. But that may well be a simple sales pitch for the expensive daytona stuff a little bit along the lines of Rens Coolant issues or possible the expensive oil v cheap oil. However not to worry I have ordered some of the black stuff to add to my extensive collection as it seems to last 50-60 applications I will gladly loan it out to take care of a fellow daytona wearers boots. I also notice from the picture your boots seem to have covers over the zips. I wonder why mine doesnt it seems a perfect solution to protect the zip from harmful dirt and water. My Daytona Ladystars do indeed have leather flaps covering both zips. As in picture below. It would appear that the male equivalent of the Ladystars are the Travelstars. They too have covered zips. However I think you Pocketpete may have the Roadstars which do not have covered zips. They also do a male version of Ladystars called M-stars which like the Ladystars incorporates a inner lift. I have added the link to their website. I thank you for your kind offer of trying some of your black polish. I will certainly give it a try and if it proves worthwhile shall consider a purchase myself. I do understand why you want to look after your boots so well when they are so expensive. However like yourself I do wonder if Daytona's insistence that only their own products may be used on their boots is true. If anyone else has these boots and used alternative products on them I would love to hear from you. Cheap boots. Plastic bags for socks. Cheap boot polish. Sorted.